Sew Inspired: It's May Giveaway Day! Thanks so much for the giveaway, I love vintage sheets and those beautiful pastel colours are so calming! yay rainbow brite! I remember her when I was little! If I win will you make me something with all those lovely fabrics? Heh. I love the vintage sheets and have not yet found any at local thrift shops. I love vintage fabric! I hope to win! I loved your quilt when you first posted it and I would *love* to win those gorgeous vintage sheet bits! Thanks for this great giveaway! and make this international so I can participate. Funny, I'm the same way with my vintage fabrics...it's (almost) more fun to think about the possibilities vs. actually using it! I'd love to make my new niece a quilt out of vintage sheets. Rainbow Brite sheets! You can definitely send those my way! wow, rainbow brite! i love the vintage sheets..thanks for a great giveaway. Lovely fabrics, I'll be very happy if I win. I totally had those rainbow bright sheets (and strawberry shortcake). I wonder if my mom has them around somewhere???? :) Maybe I should just win yours!! I loved Rainbow Brite when I was little! Thank you for giving this away! I love the vintage giveaway! Thank you! I hope I win! I remember watching Rainbow Brite at slumber parties when I was younger! I love vintage sheets! Thank you for this generous giveaway, I love it! Oh I would have so much fun with this! I love the vintage sheets...but I must have the rainbow brite! My favorite! What a great giveaway! I haven't worked with vintage sheets before but I'd love to give it a shot. Thanks! Rainbow Brite! My momma tried to make me a Rainbow Brite doll for Christmas one year when I was young. She never was able to finish it (she was a single mom who worked shift work at a hospital). There might still be a yellow yarn-haired naked doll in a box somewhere! OMG Rainbow Brite! Rainbow Brite! Rainbow Brite!! I LOVE LOVE LOVE her (yes showing my age, but whatever, I have a daughter now lol). SQUEE! I'm throwing my name into the giveaway draw and hope I come up a winner! Thanks for the chance on more fabric treats! Yep, add me in for this one. It couldn't be more fitting for me since my last name is Bright. I have a little girl too. Double BINGO! Vicki, I'd love to get my hands on some vintage sheets. Great giveaway! I would love this charm pack to make a cute quilt for my little girl. She would love it. This is a great giveaway! The fabrics are so fun, especially rainbow brite! lovely! I'm crossing my fingers. You had me at Vintage and Rainbow Brite! Thanks! Wow...Rainbow Bright...I'd love to have that sheet! No clue what it'd become, but so awesome! That log cabin is really cute. My girl would love it. Today I've had a bunch of fun typing, clicking and entering. Thanks for your participation. Rainbow Brite?! Are you kidding me! LOVE! I found a Teddy Ruxpin sheet thrifting one time and I'm hoarding it for the perfect inspiration! Awesome giveaway! Rainbow Bright and vintage sheets! Thank you so much. Great giveaway. 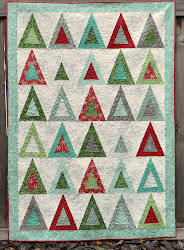 What a cute quilt that will make, thanks for this giveaway! Ahhh childhood memories! What a great giveaway! Thanks! Oooooh, I love vintage sheets! Pick me! Thank you for giving us a chance to win something so coveted. oh wow! Rainbow bright rocks!! I would love to have this!! Great giveaway - I love vintage fabrics!! 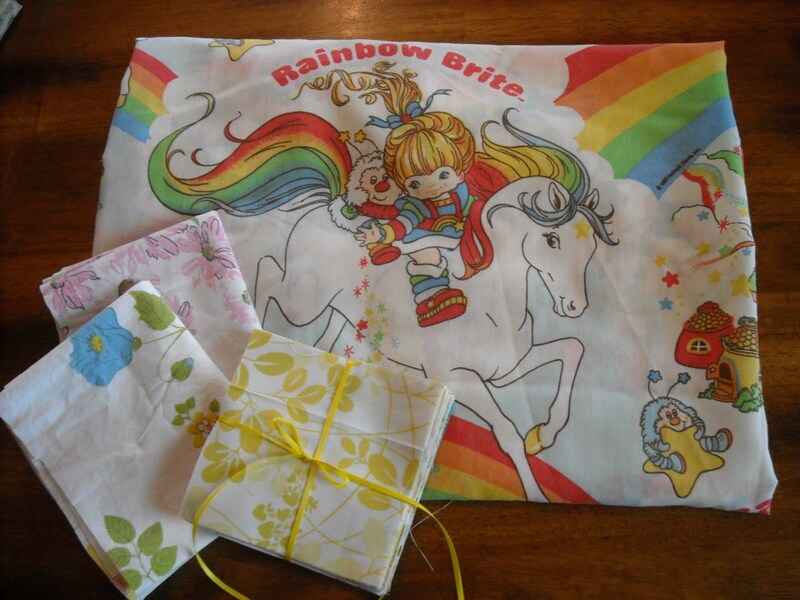 The Rainbow Brite sheet brought back so many childhood memories. Thanks for doing this giveaway! 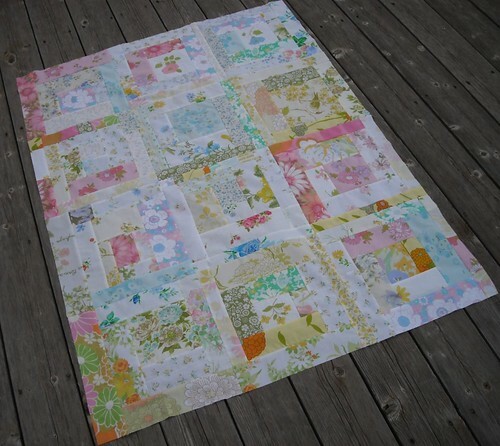 I have never made a quilt with vintage sheets...I am soooo excited to try! that quilt top is gorgeous! definitely inspiration for me. i'm collecting sheets to make a quilt. i love rainbow brite and have since i was a kid. she's so fun. Gorgeous quilt top! I love vintage sheets so much. Count me in! I'm giving away VS today too - hop on by if you want a gander - littlecumulus.wordpress.com. Thanks! I about died when I saw that Rainbow Brite fabric! I loove her! You are awesome! Oh, I loved Rainbow Brite as a little girl!!! What a cute skirt that would make for my little one and beautiful charm pack! I love that quilt! How pretty are those vintage sheets! Oh how I loved Rainbow Brite!! The possibilities with that sheet are endless. Thanks for the giveaway! I'm not sure how you're managing to give up even half of that Rainbow Brite sheet. It would make a great base for a quilt for a little girl. Please count me in. Thanks! I love Rainbow Brite! Pretty sure I had sheets similar to that when I was a little girl! I NEED THIS!!! I LOVE RAINBOW BRITE! AWESOME giveaway!! you rock! I hope i win!!!!!!! so cute! I love Rainbow Bright! i love your log cabin quilt! it is adorable! rainbow brite?! count me in!! I have been scouring our locals thrift stores for vintage sheets to no avail! What's up with the North East and their lack of vintage sheets?!! This would be a wonderful start to my hopeful collection! I love Rainbow Bright! That is so much fun!!! I love the fabrics! Thanks so much for the giveaway. What a fantastic give away! Here's hoping I win! I'm at meg(dot)thurgood(at)gmail(dot)com. Fabulous fabric, I'd love to win this! So pretty! i would be thrilled to be the winner! I really love these vintage fabrics. Thanks for this giveaway. Rainbow Brite! What a blast from my past - I used to love her when I was a little girl! I'm now inspired to search my parents home to see if they've kept any of my clothes/bed sheets from my childhood for use in projets! Oh my! I love rainbow brite. Where did you ever find this? What a fun quilt that could make! Would love to be in the running! Thanks! Gorgeous vintage sheeting, thanks for a lovely giveaway. I love your giveaways! Thank you so much for the chance to win! Rainbow Brite is super awesome. I still have my doll from when I was a kid. So cute! I would love to make something from these! What a great giveaway! I love vintage sheets and the quilt you made is beautiful. Please enter me. Rainbow Brite! I think I have doll of her upstairs packed away! OMG RAINBOW BRITE I JUST DIED!!! I love it!!!!! I think I want this more than anything ever. lol. It is my mission today to win some vintage sheets. I love them! Come check out my giveaway too. I love vintage sheets. and yes, the rainbow brite is awesome! I love your quilt and remember Rainbow Brite fondly. I need to start a vintage sheet stash. Thanks for the giveaway. oh my gosh i NEED the rainbow brite fabric. NEED. id love the vintage fabric!! I sure hope that I am the lucky winner of these wonderful vintage fabrics you are so generously giving away! thanks for a chance Vicki! you always have something fun going on here at your blog! Fun fabrics! Thanks for the giveaway! Oh please let me win!! My neice is trying for a baby and she is the biggest rainbow brite fan. I would love to be able to make her a baby quilt using the sheet. Great blog by the way! I love vintage fabrics! Thanks for the great giveaway! My kids had everything Rainbow Bright when they were growing up. I would love to win those vintage fabrics. Great to discover your blog through this giveaway! :o) Thank you for the chance of winning something lovely! I love the vintage quilt. *gasp* Rainbow Brite!!! I love it! ohh rainbow brite brings me back to my childhood...cool!!! Rainbow Brite!! I loved her. What an awesome giveaway. Rainbow Brite!? No way! Love it! Thanks for offering a great giveaway! I love the vintage sheets!The rainbow brite would make adorable kids aprons! My 20 year old daughter has requested a vintage sheet quilt for her birthday in December, and so now I need to grow my sheet collection. I hope I win! :) Thank you for giving the chance. Oh my goodness - I have a friend who would LOVE for me to make her a Rainbow Brite pillow. Her apartment color scheme is 'deconstructed Rainbow Brite' and this would be perfect for her! Rainbow Brite! I loved her, but my parents didn't like to buy branded toys, so I never got to have anything Rainboy Brite. Or Strawberry Shortcake. Poor me. I love the Rainbow Brite! Thanks for a great giveaway! Shut. The. Front. Door. That Rainbow Brite sheet really takes me back! Ack, I love it! This is my type of giveaway. Thanks for the chance to win these treasures. Thank you for this great giveaway. I have to say I love your placemat quilt swap 3. I especially love the quilting on it. So fun!! I loved Rainbow Brite! My email is rachel.cachero@gmail.com. Thanks for the extremely fun giveaway! I remember Rainbow Brite! What a lovely give-away. Aaah Rainbow Brite! I love her! This would be wonderful for a little girl! I love it! oh, rainbow brite! that brings back memories! Great giveaway! Would love to be the lucky winner! Love your giveaway! I used to have Rainbow Brite Sheets growing up! That just made my day seeing that as your giveaway! Ooh - I have just a few vintage sheets - with this set I could make a simple quilt for the summer. Love it. I love the rainbow bright! I would soooo love to make my daughter something from my past! I know she'd just adore it too! Pics to follow of whatever I make if I win!! That Rainbow Brite sheet is out of this world! What a sweet thing to share. I loved rainbow brite growing up, memories. I haven't see Rainbow Brite in decades!! Thanks so much for the chance to win this great prize package. Oh my goodness, I had Rainbow Brite when I was little, a million years ago... What a neat trip down memory lane. I've just started collecting vintage sheets and can't bear to cut them up (yet!). Cheers from New Zealand! RAINBOW BRITE!!!! Yeeeee! Thank you! WOW! I used to LOVE rainbow brite! I had books and everything with her! Ack! You had me at Rainbow Brite. I've been wanting this fabric for a looong time. My daughter would love a little outfit made from this! The other fabrics would be perfect for a quilt I'm envisioning for my new niece to be! :) I'm gonna be an aunt this August! Yeah! My best friend and I grew up watching rainbow brite together, and now she is having a baby girl, I would shower her baby in rainbow brite love!! Do you know rainbow brite fabric is nearly non-existant? You can't turn around without seeing Strawberry Shortcake, but The Brite is sorely under-represented. I hope I win!!! What a great giveaway. YEY! Hi! Thanks for a great giveaway! I love the quilt you made. The vintage material has so many possibilities...love working with it. I had those rainbow bright sheets as a child. I was obsessed with the movie too. I wonder what my mom did with them? Thanks for the giveaway! Oh what an awesome giveaway! The rainbow fabric is gorgeous!! my son loves colors and its perfect for his quilt!!! Love the Rainbow Brite! Bringing back the memories! I love Rainbow Brite! I have such happy memories from watching that show when I was little. Thanks for the giveaway! My girls loved Rainbow Brite. Good memories. I would love to win and make something for my grandgirls! OH MY. I just had a baby girl and I would LOVE LOVE LOVE that rainbrow brite sheet!! Ahhh! Thanks for a great giveaway, I'm off to explore your blog some more! It's a long time since I've seen Rainbow Brite!! How cute! Thanks for a great giveaway. My daughter loves the rainbow sheet. Thanks for the chance to win. Wow, Rainbow Bright, what a flash back to the past! beautiful quilt top, and I know it's oh so soft! And i had a rainbow brite, my little 3yo girly would love something made from that! Um, these would be *perfect* for making one of the SIX quilts that my 5 year old daughter has requested from me! I remember Rainbow Brite. The fabrics are lovely. I love that quilt you made with the fabrics, really nice. Thanks for the chance. Beautiful quilt you made and lovely fabrics. Oooh! 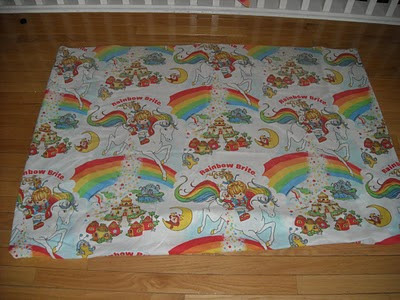 I have some vintage Rainbow Brite Sprites fabric that would go so well with that sheet! And the charm pack is gorgeous! Great giveaway! Thanks for the chance to win great fabric! OMG I loved Rainbow Brite when I was a little girl. I remember my 6th birthday party when I got her horse as my present! It almost breaks my heart to have you cut that sheet but I love it! seriously, it's kinda hurting! Love the rest of the fabrics! Thanks for the giveaway! Great giveaway! I loved my Rainbow Bright when I was 9!! I am pretty sure I had those Rainbow Bright sheets when I was a kid! Thanks for the giveaway. Oooh, I think I had those RB sheets when I was little! Fantastic! oh how i loved rainbow brite as a kid! Ohhh I love the vintage sheet ones :) great giveaway! What a great giveaway. Someone will be very lucky! Rainbow Brite! YES! Also, those vintage sheets are super pretty. Thanks for a great giveaway! yay for vintage! your quilt is simply amazing! I loved rainbow brite as a kid. It would be fun to make something for my daughter out of this. I am trying to collect enough bits of vintage floral sheets to make a picnic blanket. I love seeing them pop up everywhere. Thanks for the giveaway! Awesome. I am soon going to be working on a vintage strawberry shortcake quilt from a comforter of my sisters. This can join the party! Thanks for a chance to win your great giveaway! Thanks for your willingness to share her with us! I probably would have kept half if I were you, too! Oh my goodness - I LOVED rainbow brite when I was little! thanks for letting us all explore your blog! I used to have those sheets when I was little! I remember them SO well! My first bed in our new house was all Rainbow Bright! What a great giveaway! Thanks so much! Oh my gosh! Rainbow Brite was my FAVORITE!!! I am a total 80's child :) Thanks so much for the chance to win, love it all!